That is Merry Christmas from the Bells. And across the street is . . . drum roll! 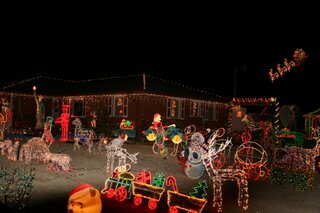 Notice Santa charging in from the northwest. He knows just where to go because you can see this display with the naked eye from Pluto. In the December 11th post, If It Ain't Broke . 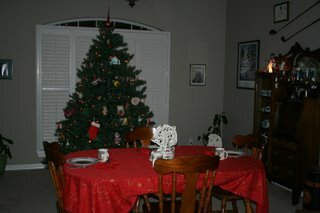 . . , I described my adventures with our twenty year old artificial Christmas tree. My daughter and I were putting the tree up last Sunday, shut up. We spent about twenty minutes stuffing tin foil into the stand to make the tree stand straight. Then we put the boughs into the little holes and strung the lights. Jess was putting the tree skirt down when we heard a crack. Uh oh. The supports for two boughs had broken clean off. I tried to super glue it, to no avail. Plastic that old rejects glue. Jess and I looked at each other and we knew. We had to put the old tree down. We went to K-Mart and actually found a new tree at a good price AND it was 40% off. Imagine, the week before Christmas! My husband was quite amused and commented that he might have to start a blog so he could write a post about the situation. So, with a bit of humble pie, here's to my hubby, who put up with that other tree many years longer than he would have liked. But what's cool is that the new tree doesn't need tin foil to stand up straight. Jess has a friend who just bought a house, and she said he might like to have a tree. She's going to ask him if he wants what's left of it. It's possible . . . he's pretty good with a C-clamp. di - well, the one on the bottom is part of an original set of clubs owned by Randy's grandfather in the 1920's. Later, his Uncle Dean owned the clubs. The one on top is the one Randy was using when he shot his first hole-in-one in September, 2005. The framed thing above it is recognition from the PGA for the event. And the secretary under all of it was purchased by the same grandfather with his bride back around 1920 for $22.70. It was later restored by the same Uncle Dean, who died in 2005, and his daughter graciously gave us the piece. The curved glass is actually the original glass (amazingly! ), and I have threatened Randy on many occasions for swinging golf clubs in the dining room, because if he breaks that glass . . . well, you don't even want to know. Kudos to you for the way you have taken hold of your try at blogging!!! di - I can't say my house is particularly 'decorated,' now that it's Randy's place of business. Imagine moving NAPA into your living room! 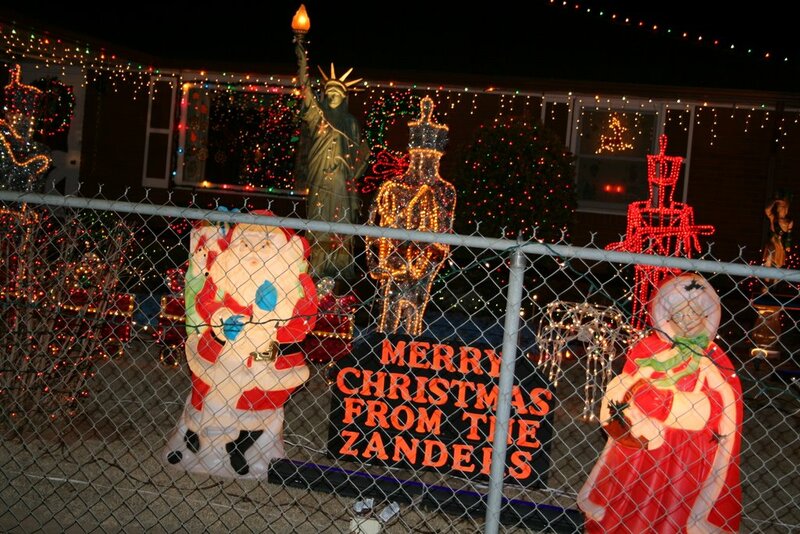 That first picture looks like Wal*Mart threw up its Christmas department on their front lawn. Last I checked, there was only supposed to be ONE Santa Claus. A quick scan of your picture shows at least 5 - but I'm sure there are more. 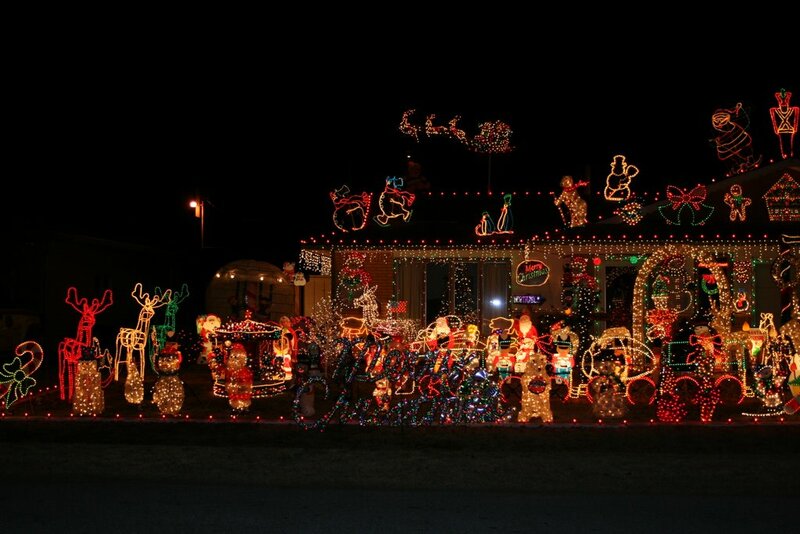 Hey, maybe you could have a contest to count the Santas! I'm jealous!!! Your tree is absolutely BEAUTIFUL!!!!! love the golf club decoration--leave it to you. You are so clever. h-man - And you only see the pictures. While I was taking them, I was being serenaded. I think I got "Most Wonderful Time of the Year" and "Jingle Bell Rock." I did notice that the neighbors didn't even have a porch light on, and they all looked like they had those light and sound blocking drapes. lois - Yeah, we really lucked out on that tree, and we'll probably have it for twenty years! I like having the clubs up. I have always tried to have 'history' around for the kids. Gives them a sense of their roots. I actually got the idea of putting them on the wall from Randy's mom, who also has one of the original Grandpa clubs (they were her father's). you amaze me linda. your house looks to be beautiful. how blessed you are. how creative. wow. 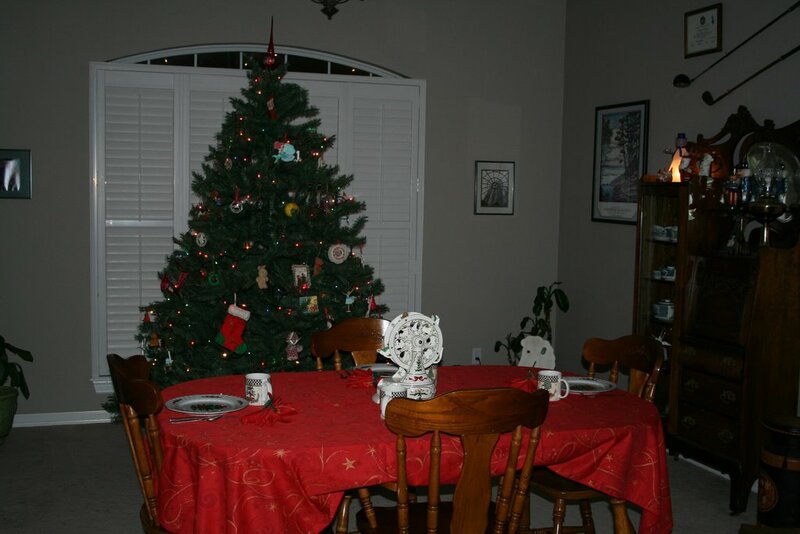 the tree is awesome, the story of the decorating endearing. loved h-man's thought on wal*mart throwing up on the lawn, pretty hilarious analogy...I cannot fathom why anyone would want all that to contend with. oh well...never stops me from looking !LOL! dorothy - Hey cuz, yes we are VERY blessed. H-man is hilarious. I can no longer imagine life without his blog. 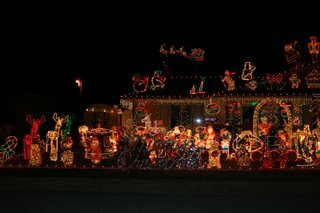 As for the lawn 'decorations,' I can't fathom where they keep them the rest of the year OR how they pay the electric bill! Congrats on the new tree. We are using one that my Hubby's parents had...so ours is pretty old. Maybe someday we'll get one of those new-fangled pre-lit ones. Hubby hates doing the lights.